A fever dream that you can’t wake up from; that’s what it felt like when I read Vita Nostra. Originally a Russian novel published in 2007, Vita Nostra has since become an international bestseller, only just now seeing a definitive English translation more than a decade later. The young Alexandra has found herself gripped in a fantastical situation where she must heed the instructions of a stranger in dark sunglasses, lest her mother becomes a casualty to mysterious forces. These instructions lead Alexandra to a facility that masquerades as a university, where the lines of reality are further blended with those of the impossible. 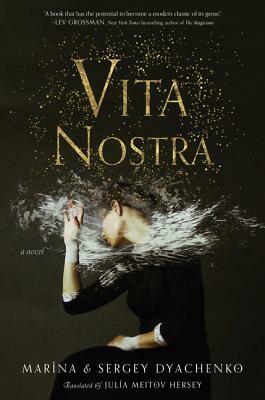 A constant ride of emotion, wonder, and difficult decisions, where Vita Nostra ultimately arrives at is a commentary on the briefness of life and the things that have gone unsaid. The definitive English language translation of the internationally acclaimed Russian novel—a brilliant dark fantasy combining psychological suspense, enchantment, and terror that makes us consider human existence in a fresh and provocative way. Our life is brief . . .
Sasha Samokhina has been accepted to the Institute of Special Technologies. Or, more precisely, she’s been chosen. Situated in a tiny village, she finds the students are bizarre, and the curriculum even more so. The books are impossible to read, the lessons obscure to the point of maddening, and the work refuses memorization. Using terror and coercion to keep the students in line, the school does not punish them for their transgressions and failures; instead, it is their families that pay a terrible price. Yet despite her fear, Sasha undergoes changes that defy the dictates of matter and time; experiences which are nothing she has ever dreamed of . . . and suddenly all she could ever want. A complex blend of adventure, magic, science, and philosophy that probes the mysteries of existence, filtered through a distinct Russian sensibility, this astonishing work of speculative fiction—brilliantly translated by Julia Meitov Hersey—is reminiscent of modern classics such as Lev Grossman’s The Magicians, Max Barry’s Lexicon, and Katherine Arden’s The Bear and the Nightingale, but will transport them to a place far beyond those fantastical worlds. Marina And Sergey Dyachenko, a former actress and a former psychiatrist, are the coauthors of twenty-eight novels and numerous short stories and screenplays. They were born in Ukraine, lived in Russia, and now live in the United States. Their books have been translated into several foreign languages and awarded multiple literary and film prizes, including the 2005 Eurocon award for Best Author. They live in Marina Del Rey, California.